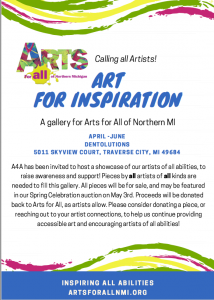 Dentolutions, a local dental office, has invited A4A to host a showcase of our artists of all abilities, to raise awareness and support! Pieces by all artists of all kinds are needed to fill this gallery. All pieces will be for sale, and may be featured in our Spring Celebration auction on May 3rd. Proceeds will be donated back to Arts for All, as artists allow. Please consider donating a piece, or reaching out to your artist connections, to help us continue providing accessible art and encouraging artists of all abilities! Are you an artist? Do you know someone who is? Share this opportunity with them! Art donations are appreciated by March 30th.